NORTHFIELD – Dazed and in shock, Patrick Winter gazed at a decade of work destroyed in an instant. His family business, Red Barn Farm, was a thriving destination outside this college town 40 miles southeast of the Twin Cities, hosting weddings and serving wood-fired pizzas outdoors amid fields of corn and soybeans. But a devastating storm that swept through southern Minnesota on Thursday night, with as many as six tornado touchdowns, exploded his 104-year-old barn and scattered it to the winds. Throughout the region, heavy rains poured down, floodwaters rose and strong winds and tornadoes left a trail of damage, hitting Rice County and the Cannon River valley especially hard. The entire city of Morristown — population 988 — was without power and water, and about a dozen homes were uninhabitable, Mayor Kurt Wolf said. Widespread power failures were reported in Cannon Falls, where officials advised affected residents to stay with family and friends for a few days. The Faribault Municipal Airport was a shambles, with more than a dozen hangars and about two dozen airplanes damaged or destroyed. Significant damage also was reported at the Stanton Airfield, 4 miles south of Randolph in Goodhue County. Yet despite the severe storm damage, no deaths or serious injuries were reported anywhere in the region. Four school districts canceled classes Friday as residents worked to clear the thousands of trees downed throughout the area. School was also called off in Waterville-Elysian-Morristown, Faribault and Northfield. As many as six tornadoes were reported across southern Minnesota, and the National Weather Service has confirmed three of those reports so far, near Faribault, Granada and Morristown. The Weather Service says radar data and spotter reports indicated that a few additional tornadoes probably occurred with the storms, with reports coming from Elysian, Medford and Northfield, but it has not yet confirmed them. Throughout the region, residents told frightening tales of the sudden, fast-moving storm. “The sky was still. 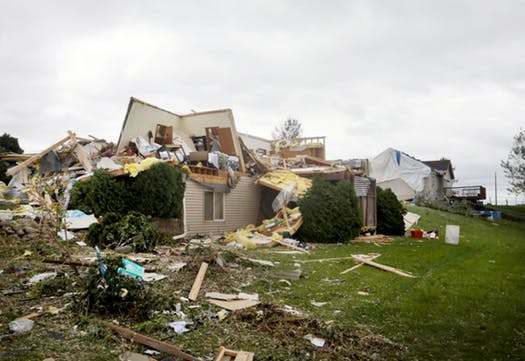 Then the wind picked up and, bang!” said Kathy Vatland of Morristown. She took shelter in the southwestern corner of her basement — “like they told me when I was a little girl” — and emerged to find her neighbor’s deck driven through her living room wall. Katie Engelmann and her four young children listened in fear as glass shattered and century-old oak trees came crashing down on her Northfield farm home Thursday night. “It sounded like a freight train over the house,” she said Friday morning from a nearby hotel where her family spent the night. The storm was just the latest in a run of hard luck for the Engelmanns. The family had been living in Florida, but was displaced when Hurricane Irma brought widespread destruction to the Sunshine State. The family relocated to Northfield and bought the idyllic farm. Winter and his extended family were celebrating his mother’s 77th birthday with a dinner in the barn when the storm hit. The entire group — 13 people and a dog — took shelter in a tiny, 4-by-4-foot room on the ground level, where they feared they might be buried alive as huge chunks of debris came crashing down. It wasn’t the first disaster for Winter. He was living in Grand Forks, N.D., during the devastating Red River flooding of 1995. The Weather Service sent out several survey teams to determine the location and strength of the reported tornadoes. In parts of southeastern Minnesota, up to 4 inches of rain fell in a short period. And the Minneapolis-St. Paul International Airport recorded a daily record rainfall of 3.28 inches on Thursday, beating the old mark of 1.82 inches from 1902, the Weather Service said. Copious rains pushed the Minnesota River out of its banks near Henderson, prompting the state Department of Transportation on Friday morning to close Hwy. 93 between the city and Hwy. 169. Damage also was reported in western Wisconsin as storms rolled along a line from Mankato to Red Wing and into the Badger State. In Spring Valley, the middle and high school building “received significant damage,” Principal Gretchen Cipriano said in a message posted on the school district website. In Mankato, winds gusted as high as 70 miles per hour. In Red Wing, winds topped 63 miles per hour. Waseca recorded a gust of 61 miles per hour, the Weather Service said. In the Twin Cities metro area, heavy rain fell throughout the afternoon and evening, slowing traffic to a crawl, flooding streets and basements and causing many power failures.